Some people have enough trouble with their teeth that they decide to have them taken out. Typically these people have been high risk for tooth decay and/or periodontal disease for a long time. The risk factors they had (tough bugs, low saliva flow, pop consumption, smoking, etc) overcame their ability to maintain their teeth. Many of these patients slowly lose teeth over time and finally come to a decision that they’re going to have their teeth removed. Sometimes they have a plan, sometimes they don’t. Most are just tired of what they perceive as a losing battle. Traditionally, these people have dentures made. 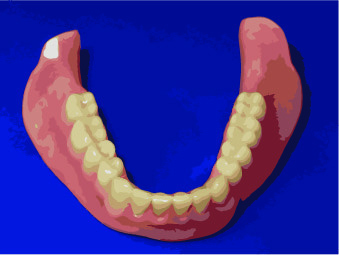 A denture is a plastic prosthesis made to look a lot like teeth. 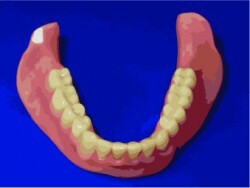 Dentures can be made to look VERY realistic and in most cases they are more cosmetic than the patient’s existing teeth. However, dentures cannot function like natural teeth. And you take them out. They aren’t attached like your teeth. Teeth are supported by bone in your jaw. This bony ridge is called alveolar bone or just the alveolus. The alveolar bone is only there to support the teeth, so once the teeth are removed the bone tends to shrink. It shrinks a lot at first, right after the teeth are removed. Some people tend to lose a lot of alveolar bone after their teeth are removed, some people less. Usually it will continue to shrink away throughout a patient’s life, which will require dentures to be relined or even remade over time. In the best case scenario, an upper denture fits like a suction cup over the alveolar bone that’s left after teeth are removed. 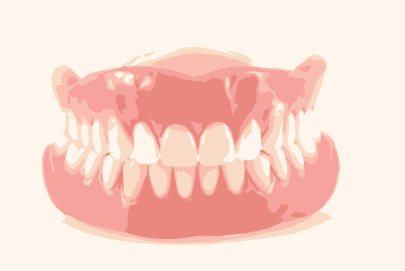 Upper dentures can be very stable when they fit well because they have a lot of surface area to cover. 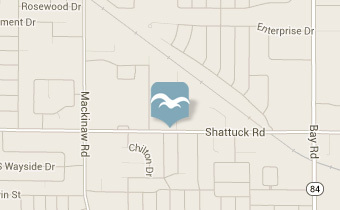 It’s kind of like a snowshoe. The more area you can cover, the more stable you’ll be on the snow. Some patients that have had lots of trouble with their teeth in the past find an upper denture to be a real improvement. Especially if it fits well and looks nice. Often people start their denture experience with the upper and then choose to do the same with the lower. I cannot tell you how many times I’ve had patients that were disappointed by lower dentures even after having a well fitting upper denture made. It’s like a horseshoe, balancing on a tightrope, in a hurricane. The lower denture is horseshoe shaped, like the shape of your lower jaw. So already you’re starting at a disadvantage from the upper. The upper has a bunch of surface area to keep it stable. A lower denture doesn’t. The lower is balancing on a “U” shaped ridge of bone with no suction. Furthermore, you’ve got your lips on one side and your tongue on the other side. Your lips and tongue are muscular structures that are constantly moving while you speak, chew, swallow, play saxophone and whatever else you might do. By doing your normal, everyday thing your lips and tongue are constantly working to move your lower denture around. If you’re getting the feeling that lower dentures are a nightmare, you’re right. I’ve gotten to a point where I won’t recommend them unless the patient is willing to have dental implants placed. Dental implants can be used to hold a hold denture in place or even can be used to completely replace the teeth, with no need for a removable denture. 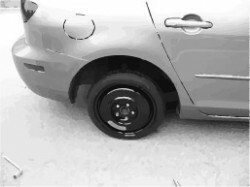 Having an upper denture is like having a full sized spare tire. It’s not as good as the wheel that was factory installed, not even close. But it looks about right and you can learn to get by with it. The lower denture is like a half inflated donut spare. It kind of looks like a wheel, but you can barely function with it. Some folks even adapt to it, but they definitely won’t be going highway speeds. Did you find this post discouraging? Did it make you grateful to have teeth? I’d love to hear about it! You can share any Mead Family Dental post with a “Like” on Facebook, a “+1″ on Google+ or you can even “Tweet” it with Twitter! All you need to do is hover over the heart shaped button next to the title of the post. Or you can leave a comment by clicking on the balloon shaped icon next to the title.